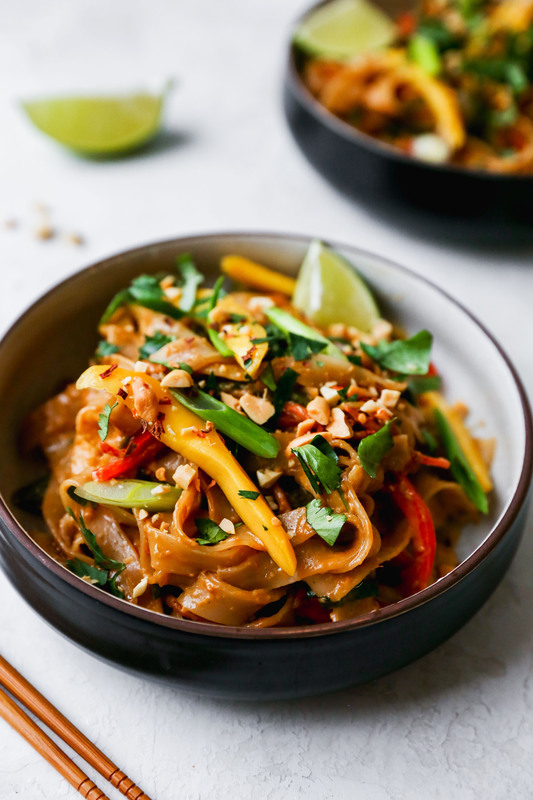 A quick and easy Spicy Peanut Noodles With Mango recipe with a spicy homemade peanut sauce that is tossed over noodles and topped with peanuts, green onions and lime. If you are a Thai takeout lover like I am, this is the easy dinner recipe you have been waiting for. 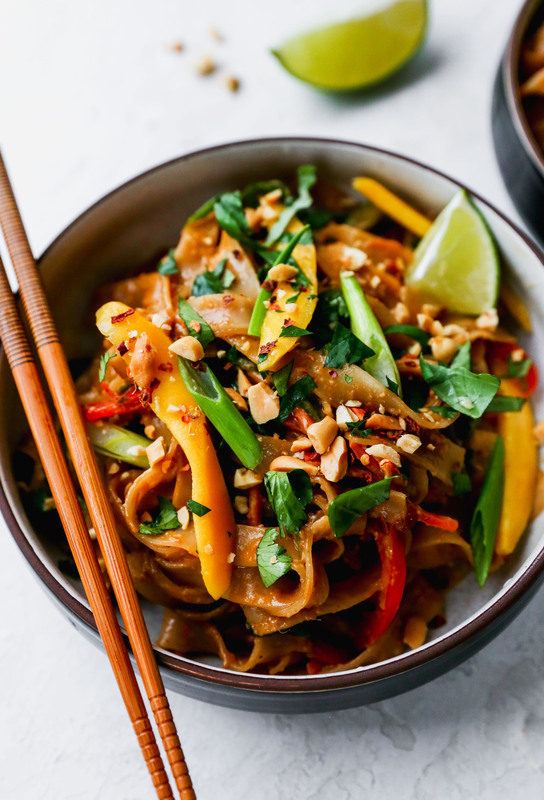 These Spicy Peanut Noodles take just 20 minutes to whip up. That’s faster than you can even order and pick up take out!! You can add a protein — chicken, beef, or even tofu — or leave them just as they are. Either way, you are looking at the perfect Thai noodle dish for a quick weeknight dinner. I have a few favorite Thai take out dishes that I like to order when we are having an extra lazy night. First is Pad Thai. The yummy noodles and sauce with the crunchy peanuts on top always get me. Second is a dish they make at most Florida Thai restaurants called Amazing Chicken. Amazing Chicken is a creamy peanut sauce with a little heat with chicken and broccoli tossed in it. 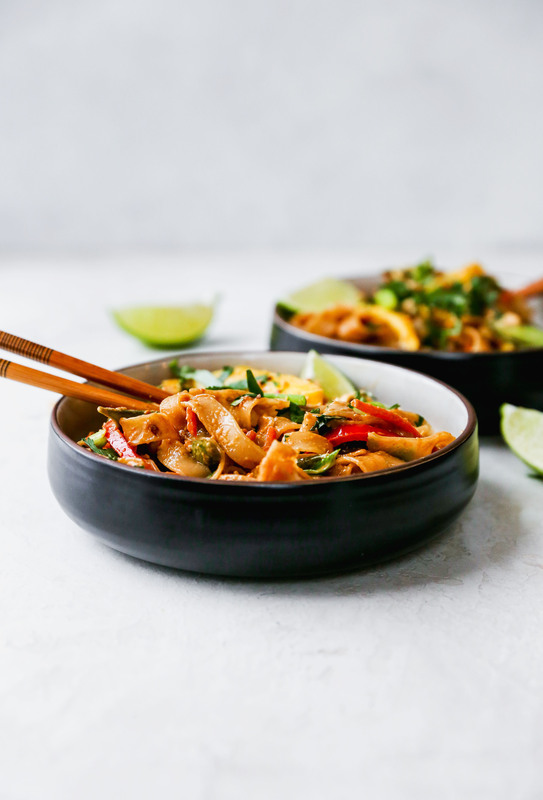 This Spicy Peanut Noodles recipe is a hybrid of those two dishes combined into one glorious recipe I can easily make at home. I know this is very common for women who make it to 40 weeks, but my impatience is reaching a new level! I am a planner. I like to know when things are coming. It’s a natural coping mechanism to my anxious tendencies. So, this whole waiting game has been tough on me. Not to complain! I am still so beyond grateful to have had an uneventful and healthy pregnancy thus far. And I am so grateful for what (who) is about to come. In any event, no matter when our newest addition makes his debut, I am alllll about quick and easy meals right now. For both lunches and dinners. My energy level is low and standing on my feet cooking for long stretches is not really in the cards at the moment. So, easy meals that come together as quickly as possible are my focus. And these peanut noodles totally fit the bill! This meal, depending on the recommended soak time for your noodles, can be ready in as little as 20 minutes. All the ingredients are things I usually have on hand. A stocked pantry makes life so much easier, people! I highly recommend you stock up on ingredients like soy sauce, dried rice noodles, and chile-garlic paste. It makes meals like this come together with hardly any thinking at all. Growing up, my mom would make her version of spicy peanut sauce and serve it over regular pasta noodles with stir-fried veggies. It was one of my favorite things she made. Ever. I would get so excited when I learned the peanut noodles were for dinner. They were delicious hot or cold, and she always made a huge batch so we could munch on them for a couple days. They were the perfect combo of savory and sweet, spicy and salty, and were texturally awesome. These noodles are a homage to that, with my own tweaks thrown in. You soak the noodles, whip the sauce up in minutes in your food processor, and stir fry some veggies. All that’s left to do is toss everything together with some fresh mango slices, herbs, a spritz of lime juice, and some chopped peanuts. It all comes together so fast. These, on top of being ridiculously easy, are incredibly tasty. So much flavor! And for all you vegetarian and vegan folks, these are both! Even if accidentally so. It all starts with a spicy peanut sauce, flavored with sweet, juicy mango. The mango adds a nice fruity twist on the classic spicy peanut sauce, and I am completely hooked. Side note: the sauce is delicious all on it’s own. I used the little bit I had left over as a veggie dip. Delicious! Don’t be alarmed by the long ingredient list. Like, I said, once you get in the habit of stocking your pantry and fridge with these ingredients, it’s really easy to throw something like this together with little thinking or planning. Plus, Asian ingredients have a LONG shelf life. Think of it as an investment in your future culinary self. Feel free to make the sauce your own, as well. Don’t like spice? Add less chile paste. Too sweet? Cut the honey. Allergic to peanuts? Swap with almond butter. Really, make it and taste as you go. I find that is key with most recipes, anyway, but especially sauces like this one. However you tweak these, dinner is less than 30 minutes away and is oh so satisfying. It’s like fast takeout, healthified a bit but with all the flavor and comfort you need. If you need me, I’ll be drowning my too-pregnant sorrows in large bowls of these noodles until baby boy decides to grace us with this presence! We start with boiling some linguine pasta. You can also use spaghetti noodles or fettuccini noodles. While the pasta boils, you quickly whip up your homemade spicy peanut sauce. If you have all the ingredients out and ready to go, it goes very quickly. 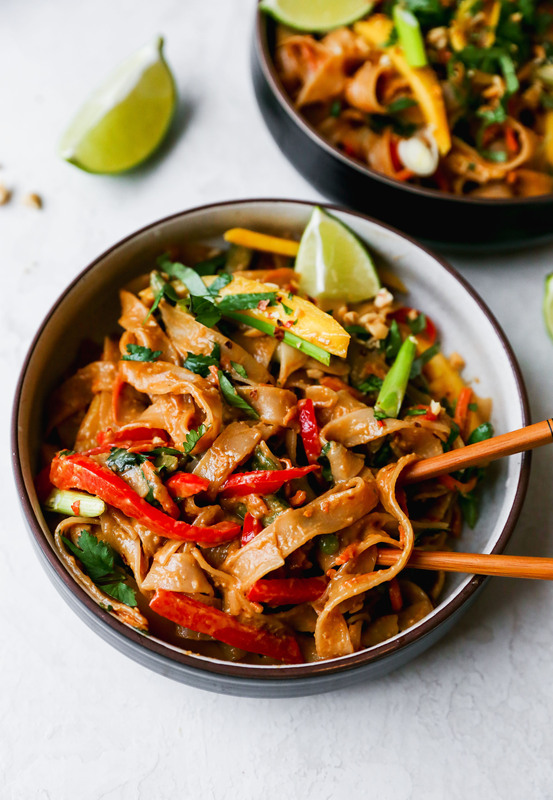 You can make these Spicy Peanut Noodles vegetarian by using a vegetable stock instead of chicken stock. Either work great. I like to use Sriracha and crushed red pepper to spice up my peanut sauce, but that is optional. You can only use one of those two to add some heat if you like it lightly spiced, or you can leave the spice out completely if you prefer! Whatever you do though, do not skip the toppings! They add so much flavor and texture to the dish. I like to top my Spicy Peanut Noodles with sliced green onions, crushed peanuts, and fresh lime juice. If you are like my husband and like your noodles with extra heat, you can also drizzle on a little extra Sriracha! Head over to Dixie Crystals for the full recipe I developed for them! Soak the noodles in hot water, according to the package directions. Once tender, drain, rinse, and set aside. Depending on the brand of rice noodle you are using, the recommended soaking time may be anywhere between 15-30 minutes, so I like to do this step first. That way, the noodles are ready and waiting for me when I need them. Pulse to combine, scraping down the sides a couple times, and then run the machine until the mixture is smooth. Stream in the warm water, a tablespoon or so at a time, until the sauce thins out a bit. It should be loose at this point – the starch from the noodles will help thicken it up. Season, to taste, with additional honey, chile paste, or soy sauce (I find that sauces like this are definitely a “to taste” kind of deal. Make it as spicy, sweet, or salty as you prefer). Add the bell pepper, shredded carrots, and snap peas and cook for 2-3 minutes or until they are tender crisp. Add the drained noodles, along with the sauce, and toss to combine everything. Add in the mango, basil, cilantro, lime juice, and scallions and continue tossing and stirring for a couple minutes or until everything is warmed through and evenly coated in the sauce. Serve immediately, garnished with additional herbs, the chopped peanuts, and lime wedges.